Red Onion Burgers in Mountlake Terrace is hosting a Dining for Dollars fundraiser on Wednesday, August 8 to benefit the family of Kent Police Department police officer Diego Moreno, who was killed in the line of duty July 22, 2018. He is remembered as an exceptional police officer, a dedicated Family man and a loud, fun-loving friend who lived life at 1,000 miles per hour. The event will run from 11am - 8pm August 8 at the restaurant, located at 21005 44th Ave W. in Mountlake Terrace. 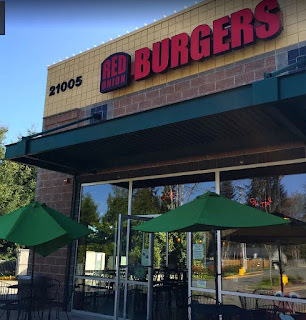 Red Onion Burgers will donate 25 percent of all sales and 100% of all tips and will also hold a raffle and auction. Moreno’s death has been mourned across Puget Sound, but his passing also has a local connection, said Red Onion Burgers owner Seaun Richards. Kent is home for Mountlake Terrace Police Chief Greg Wilson. Red Onion Burgers’ supplier Food Services of America has a huge warehouse in Kent and is donating food to show their support. Auction items include A STING signed guitar, GARTH BROOKS signed guitar, KEN GRIFFY Jr. signed baseball, RUSSELL WILSON signed football jersey, plus more. Dining for Dollars is a program associated with Red Onion Burgers that has donated over $225,000 to local community organizations in the last eight years. Community support includes donations to Deputy Dan McCartney family, Oso Mud slide, Lake Chelan Fire and many more. Community support includes local businesses, Talk Radio 570 KVI and more. The restaurant could also use volunteers for the event. Call Seaun Richards at 425-218-5996 if you can help or donate.